Our technology is based on convolutional neural networks – the same AI technology that recognizes faces in a crowd, enables self-driving cars, and allows you to talk to your phone. Our technology uses a statistical approach that extracts the insights from millions of experimental affinity measurements and thousands of protein structures to predict the binding of small molecules to proteins. This fundamental tool makes it possible for chemists to pursue hit discovery, lead optimization and toxicity predictions with unparalleled precision and accuracy. The greatest challenge today in pre-clinical drug discovery and development is identifying a drug candidate that is both effective and safe. It is a problem faced by researchers in every pharmaceutical company, whether small or large, and in thousands of research institutions across the world. What potential drugs will bind my target protein? How do I make my drug more potent? How do I reduce off-target effects? How do I improve ADMET properties? These are complex questions and invariably an improvement in one feature leads to trade-offs in others. A chemistry team typically tests hundreds to thousands of compounds and must strike a balance between many different properties. The end result is often part educated deduction and part chance, and often development will stop before the drug reaches the clinic because the optimization process has run out of time and resources. Our technology uses a statistical approach that extracts the insights from millions of experimental affinity measurements and thousands of protein structures to predict the binding of small molecules to proteins. This type of complex multi-task optimization is something computers are great at. Our AI technology makes this optimization smarter and faster by finding patterns in the data that a human would never be able to see. AtomNet removes some of the physical barriers that limited the success of drug discovery. Research and development is no longer constrained by the limited number of compounds available in a library, and the time to screen these compounds. Atomwise can analyze a very large chemical space – billions and billions of compounds – to identify a small subset with high specificity for synthesis and testing. Discovery and optimization processes that traditionally take years can be compressed with Atomwise’s technology to a matter of weeks. What makes Atomwise’s technology so powerful? What makes Atomwise’s technology so powerful? A combination of patented structure based convolutional neural network for drug discovery, and enormous amounts of data. A deep convolutional neural network learning to recognize facial features. Atomwise’s technology was first developed by Dr. Wallach who was previously a PhD student in the Computational Biology group in the Department of Computer Science at the University of Toronto – a leading center for modern AI technology. Convolutional networks are known to achieve the best predictive performance in areas such as speech and image recognition by hierarchically composing simple local features into complex models. This idea was applied to chemistry to predict the bioactivity of small molecules for drug discovery applications. This research and subsequent developments led to AtomNet. AtomNet showed that the convolutional concepts of feature locality and hierarchical composition could be applied to the modeling of bioactivity and chemical interactions. Specifically, where an image is represented as a 2-dimensional grid of pixels containing channels for red, green, and blue colors, AtomNet represents a protein-ligand pair as a set of 3-dimensional volumetric pixels containing channels for carbon, oxygen, nitrogen, etc atom types. In this way, AtomNet autonomously learns the features governing molecular binding, and avoids the manual process of tweaking and over-parameterizing binding features that typified traditional computational methods. 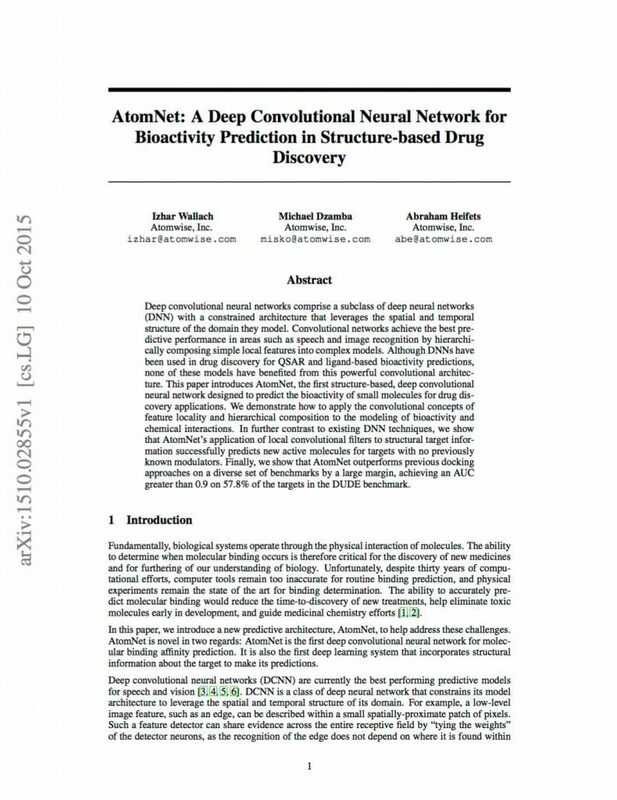 AtomNet’s application of local convolutional filters to structural target information was able to successfully predict new active molecules for targets with no previously known modulators. Sulfonamide Detector AtomNet learning to recognize sulfonyl groups – a structure often found in antibiotics. Biochemical interactions are primarily local, and can be modelled by similarly-constrained machine learning architectures. Chemical groups are defined by the spatial arrangement and bonding of multiple atoms in space, and these atoms are proximate to each other. When chemical groups interact, such as through hydrogen bonding or pi-bond stacking, the strength of their repulsion or attraction may vary with their type, distance, and angle. These molecular interactions are predominantly local effects. As with edge detectors in convolutional neural networks for images, the applicability of a detector for hydrogen bonding or pi-bond stacking is invariant across the receptive field. These local biochemical interaction detectors are then hierarchically composed into more intricate features describing the complex and nonlinear phenomenon of molecular binding and long-range or distant effects such as water-mediated hydrogen bonding, magic methyls, or resonance.